The proposed new zone lines for P.S. 8 and P.S. 307. VINEGAR HILL — A controversial proposal to change school zones across Brooklyn Heights, Dumbo and Vinegar Hill has turned into a debate over integration and diversity, with parents from a school currently serving a majority of low-income students calling on the DOE to help preserve their existing community in the face of growing gentrification. The Department of Education presented its final plan for rezoning Brooklyn Heights’ P.S. 8 — a mostly white and wealthy school — and Vinegar Hill’s P.S. 307 — where most students are black and Hispanic and low-income — at a public meeting Monday night. The new plan, which would move more blocks from the pricey neighborhood of Dumbo out of P.S. 8’s zone and into P.S. 307’s zone, would also include an admissions quota to ensure the school’s population would not become like P.S. 8 in a few years but rather maintain a diverse student body. But P.S. 307 parents say the plan doesn’t go far enough. The move comes amid a growing debate on how to make the city’s schools — which are the most segregated in the nation, according to a 2014 UCLA study — more integrated. It also comes on the heels of the city’s pilot admissions initiative to help boost diversity at seven schools in Brooklyn and Manhattan where principals petitioned more than a year ago to create new enrollment policies as they watched their student bodies become less diverse in recent years. At P.S. 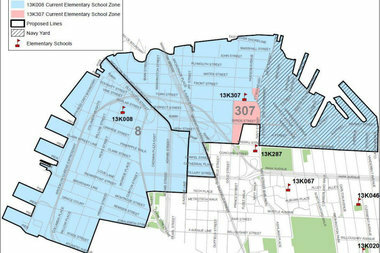 307, the DOE would give priority to low-income students to help preserve the existing school community, where most of the students are black and live in nearby Farragut Houses. Students who are eligible for the free or reduced-price lunch program would be given priority for 50 percent of the seats of incoming classes — but only for the seats remaining after children who live in the zone are already given offers. The DOE’s presentation Monday began a 45-day clock for District 13’s Community Education Council, a panel of parents, to vote on the rezoning proposal. If approved, the new zones would be implemented in the 2016-2017 school year. But the admissions quota wouldn’t go into effect until the following year. If the proposed rezoning is approved, DUMBO — one of the most expensive neighborhoods in New York City — would be zoned for P.S. 307, causing parents from that school community to fear minority students will be pushed out by affluent white families from the richer neighborhood. DOE representatives from the Office of District Planning said the quota was proposed in response to that feedback from parents. But P.S. 307 PTA co-president Faraji Hannah-Jones criticized the DOE’s quota for not doing enough to preserve the school's existing community. Hannah-Jones argued that the school’s admission policy still favored families from the rapidly-growing DUMBO neighborhood, which is far bigger than the Farragut Houses community. "When we said 50 percent, we didn't say 50 percent with conditions," Hannah-Jones said at the meeting, referring to the plan to give slots to low-income students only after seats are filled by families who live in the new zone. "We don't want P.S. 307 to become P.S. 8," he said, referring to P.S. 8’s status as a white, affluent school. Still, even with the changed admissions that might help P.S. 307’s current demographic make-up, it may not help them keep the school retain its Title I funding, which supports many of the school’s programs. To get Title 1 funding, at least 60 percent of a school's students must receive free or reduced-price lunch. Ansley Samson from the P.S. 8 PTA said her school would support the rezoning. The DOE’s main reason for rezoning is to combat severe overcrowding at P.S. 8, which currently has one of the largest zones in the city. This year it had a waitlist of 50 families. P.S. 307, a magnet school, has a much smaller zone and is under-enrolled. There are currently 386 students at the school, according to DOE. The projected enrollment over the next several years would be between 670 to 770 students if the rezoning goes through, officials said. The proposed zones would more equally split neighborhoods between the two schools, moving DUMBO to P.S. 307’s zone and leaving Brooklyn Heights and Concord Village (near the Brooklyn Bridge entrance,) with P.S. 8. The Community Education Council has the final vote on whether the rezoning moves forward next school year. They are expected to vote by early January, before the end of the upcoming kindergarten application season between Dec. 7 and Jan. 15. Some leaders on the community education council saw the quota as a step toward preserving diversity in the school but not a move that would address the larger issue faced by the district in terms of segregated schools that result in schools with inequitable resources. Waiting for a citywide solution, however, would do a disservice to communities who might be pushed out of their neighborhood schools, CEC member Ben Greene said at Monday's meeting. The CEC’s chair David Goldsmith supported the 50 percent set aside, but said they really needed a district wide planning to support diversity and that parents and school leaders were working on a such a plan to address the broader issue of segregation. So while an individual set aside at this one school was the best that parents could hope for right now, Goldsmith urged the community to understand that it would be "problematic,” he said, since changing the policies at one school sometimes has unintended consequences at other schools nearby and did little to address the overall issue of segregation.